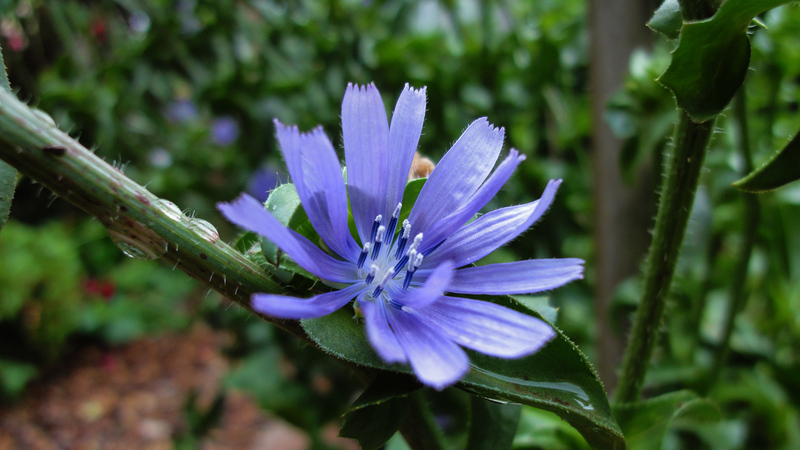 Common chicory, Cichorium intybus, is a somewhat woody, perennial herbaceous plant usually with bright blue flowers, rarely white or pink. Various varieties are cultivated for salad leaves, chicons (blanched buds), or for roots (var. sativum), which are baked, ground, and used as a coffee substitute and additive. It is also grown as a forage crop for livestock. It lives as a wild plant on roadsides in its native Europe, and in North America and Australia, where it has become naturalised. "Chicory" is also the common name in the United States for curly endive (Cichorium endivia); these two closely related species are often confused. 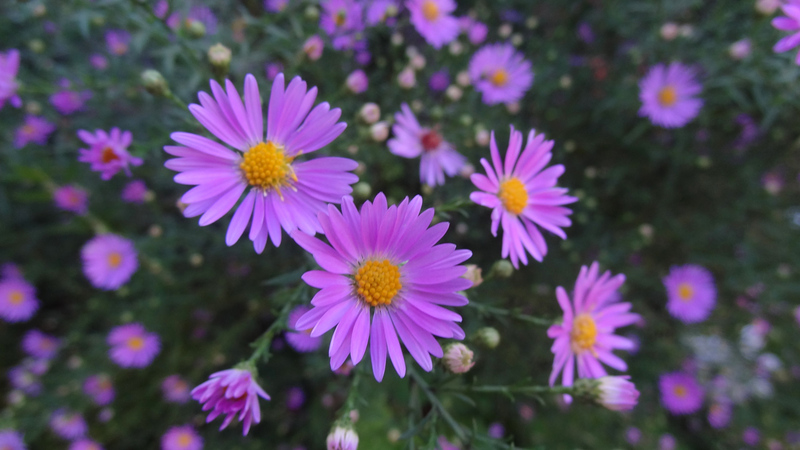 Easter (or Michaelmas) daisies (Aster novi-belgii) were once popular in gardens, but are less frequently seen now. They are herbaceous perennials with upright, much-branched stems on which masses of small daisies are produced in late summer and autumn. The flowers range in colour from white through pale lilac blue, mauve, purple and pink to deep reddish plum. They can be planted in mixed borders and can also be used effectively in beds on their own. The taller varieties often need staking, and are best planted at the back of garden beds. A. novi-belgii was introduced from North America into Britain in 1710. In America they were called New York daisies, however, in England these plants bloomed at the same time as St Michael's Day is celebrated (September 29th), and so they became associated with the festival of Michaelmas and were given its name. In the Southern hemisphere where Easter is an Autumnal feast, the daisies bloom at about this time and hence the term "Easter Daisies". These daisies are easy to grow. 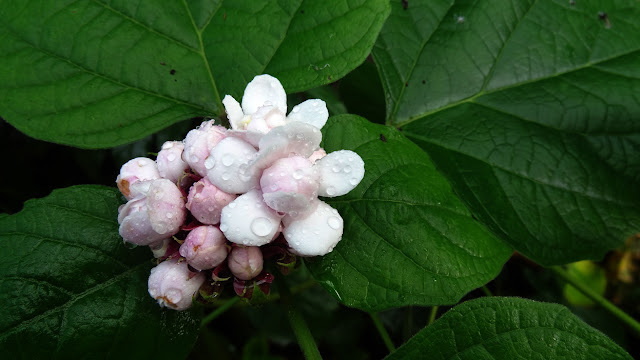 Plant them in full sun in a rich, moisture-retentive soil. When they die down in winter cut the dead stems back to ground level. When the new shoots appear in spring, apply a mulch of well-rotted manure or compost to which fertiliser has been added. Lift and divide the clumps every second or third year in winter. 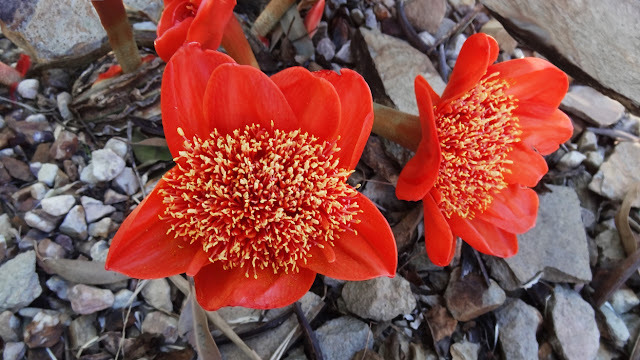 Haemanthus coccineus (commonly known as the Blood Flower or Paintbrush Lily), is a bulbous geophyte in the genus Haemanthus, native to Southern Africa. The generic name Haemanthus is derived from the Greek words haima for "blood" and anthos for "flower"; coccineus is the Latin word for red or scarlet. In the Afrikaans language it is known as Bergajuin, Bloedblom, and many other vernacular names. The Blood Lily is native throughout the winter rainfall region in Southern Africa - from the southern parts of Namibia, to South Africa in the Cape Peninsula, to the Keiskamma River in the Eastern Cape. It is an adaptable species, growing in a wide range of soils derived from sandstones, quartzites, granites, shales and limestones. It will survive annual rainfall ranging from 100–1,100 millimetres. The large (up to 10 cm diameter) flowerheads of Haemanthus coccineus emerge between February and April in the Southern Hemisphere, with scarlet spathe valves on them like bright shaving brushes, making it a striking plant. The flowers are soon followed by translucent, fleshy berries. There are usually two very large leaves per bulb, and occasionally three, these leaves appearing only after flowering has occurred. We have it growing in our garden quite happily and it always attracts a lot of attention when it is in bloom.